UPDATE: The Secretary General issued a note verbal with an invitation to member states to submit nominations for the post of Executive Director. Ms. Bachelet served as Chile’s president prior to her appointment, and is returning to her country by the end of this month. She is expected to be nominated for a second term as President next month and is a strong favorite to win the election in November. The head of the agency holds the rank of Under Secretary General and is appointed directly by the UN Secretary General. Possible successors to Bachelet will be identified by a senior appointment team, which is expected to shortlist three final candidates for the Secretary-General’s consideration. 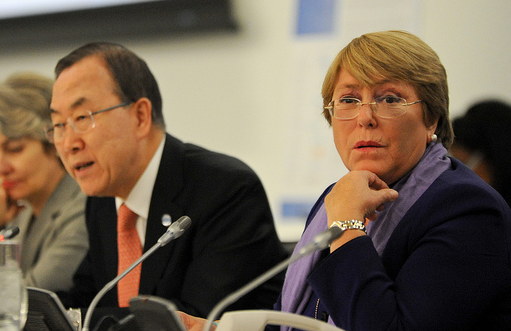 In 2009, Bachelet was chosen from among 26 candidates nominated by member states and civil society groups. The post is nominally filled for a four-year term, though Bachelet’s immediate successor will likely receive a slightly truncated appointment. As a member of the Secretary General’s cabinet, she will likely step aside at the conclusion of Ban’s second term on 31 December 2016 or offer her resignation to his successor in early January as part of the transition. Names of possible successors have yet to emerge, given Ms. Bachelet’s unexpected announcement last Friday. A UN spokesperson noted that Ban intends to seek out a successor capable of “carry[ing] on the work” initiated by Bachelet. A note verbale laying out the terms of reference and inviting nominations will likely be released within a few weeks (see 2010 note), with the selection process tacking closely to the 2010 timeline. Ban’s invitation to member states in April that year preceded even the General Assembly formal approval of the new agency in July in order to facilitate its operational launch. Candidates were vetted by the senior appointment team and the Deputy Secretary General over the summer, with Bachelet’s appointment announced in mid-September prior to the incoming General Assembly session. “We need someone who is an incredibly strong advocate for women’s rights, someone who is going to take on leadership of this organization at this moment when we are facing a financial crisis and when the gains that we have made in so many countries are at risk of being eroded, in part because of the financial crisis,” Bisnath told Devex.